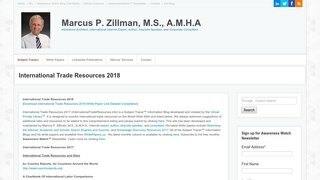 The above is the associated white paper link compilation of the International Trade Resources 2018 Subject Tracer™ Information Blog by Marcus P. Zillman, M.S., A.M.H.A. It is now a 28 page .pdf document 243KB. [Updated completely with all link validation and new links added on March 2, 2018] Other white papers are available by clicking here.